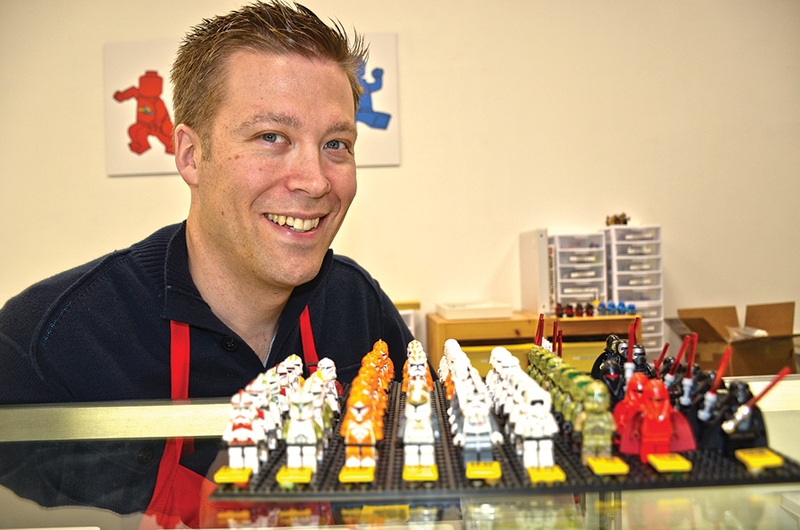 Matthew Bauman, the franchise owner of the new Bricks & Minifigs on River Road North, knew that local Lego enthusiasts were looking forward to the store opening. Still, the response surprised him. “I was away from the shop for a little while on the first day and called my wife. She told me there were 20 people in the store shopping and to get back as soon as possible. It feels like everyone has been very excited and welcoming,” said Bauman. Bauman opened the shop, located at 3670 River Road N., about three weeks ago and a steady stream of customers was still flowing through the doors in the run up to Christmas. “We have a lot of people shopping for new sets as gifts, but we’ve also sold a lot of bulk bricks and taken in a lot of trades which has helped us build our stock,” Bauman said. The Bricks & Minifigs franchise started with a shop in Canby and that was where Bauman rekindled his love for a childhood passion. “I took my kids, Luka and Liesl, there and then we pulled out some of my old sets and saw how well everything fit together,” Bauman said. When he and his wife, Sarah, were looking for a new business opportunity, Sarah asked how he would feel if a Bricks & Minifigs shop opened up in the area and he wasn’t the owner. It led to them purchasing the franchise last April and they’ve spent the last seven months preparing for the opening while working in vacations and business trips. “I knew it would be more fun to be in control,” Bauman said. Brick & Minifigs stock-in-trade is the rebuilding, reusing and reimagining of the Lego world that is rapidly approaching its 75th year. Bauman’s store has sets big and small for casual fans and die hard builders. Those with old sets or even a collection of mismatched parts can trade them in for store credit or cash where they will be resold as complete sets or broken down into bulk bins that can be purchased by the bag. Bauman said the attraction for most builders is the store stock of minifigs. Glass cabinets contain them by the hundreds and they can be purchased individually. “A lot of times, someone will lose a figure that completes a set and we try to have a big selection on hand,” Bauman said. It’s also a way to build out armies of figures like Star Wars Stormtroopers. Brick & Minifigs also carries a selection of third party items compatible with Legos. “The one thing Lego doesn’t make a lot of is weapons, but there are people who want to recreate Civil War battles. We have weapons that would fit that style and even things like tanks,” Bauman said. They can also host birthday parties on site. Attendees will have access to a derby track and access to enough Legos to let their imaginations wander. They also get to leave with a minifig. Store hours are 10 a.m. to 6 p.m. Monday through Saturday and noon to 5 p.m. on Sunday. For more information, call 503-390-1830.